I came into the day today with a bit of a sense of dread in my stomach. My grandmother has been having some heart problems, so I've been worried about her, and family drama abounded. Plus, I had the Meeting Of Doom stretching before me beginning at 9 am. I told myself that I'm grateful that I have a job and that we were not furloughed this week; I should feel glad just to be here and to be getting paid. And I am. But still. So much sighing. I have a hard time sitting still for meetings that last 2 hours plus, and this one promised to be a doozy. I loaded up on tea heavily flavored with vodka... just kidding :) That's what I *wanted* to do, but I didn't, you see. Instead I stopped off at Dunkin' Donuts on my way in and got a gigantic cup of tea with double cream and double sugar. I should have made that a triple/triple. The meeting actually wasn't as bad as I feared, but honestly, part of that is that my standards for meetings are so low :) If I don't actually harm myself so that I can get out of the meeting earlier, I consider such a meeting "not that bad." So, that's what we ended up with this morning. All I'll say is that meetings so often get bogged down with commenters who just don't know how to keep their comments anything resembling concise. Alas. It's a fact of working life. So, then, I got back to my office to find my sisters clamoring for my electronic attentions. Lots of new developments with our grandmother. She's in the hospital, and will have bypass surgery within the week. Prayers are much appreciated. We have lots of concerns about caring for our frail grandfather with her laid up, as well. It's all very difficult. After all that, I collected my stuff and headed to knitting group. I arrived late, and quickly got to work on the prayer shawl I'm making for my grandmother. Whereupon I was presented with the magnificent chaplet of Our Lady Star of the Sea that I blogged about last week from my beloved knitting friends! I was so thrilled I could hardly contain myself. The funny thing is, even though I wasn't planning to buy the chaplet (trying to conserve money...) I was still stalking it on etsy so that I could admire it. And Monday morning I noticed that someone had bought it. I sniffled. And I thought to myself "I wonder if someone saw it on my blog and bought it... That's exciting! I'm happy for them, but on the other hand, I WANT IT." I even went back and sadly looked at the Sold listing, so that I could read about it and look at it some more. Pretty pathetic, really. Your Catholic Librarian doesn't exactly have a sparkling social life. And then, at knitting group today, my friend Karen whipped it out of her knitting bag and said that they had all chipped in on it for me. *squeals* I love, love, love it. I promise to post a picture of it tomorrow. The bottom of the chaplet features a beautiful medal of Our Lady Star of the Sea. In the image, Mary is holding the child Jesus, and they are in a boat, right on the water. Mary is wearing a crown. The chaplet consists of 15 beads. The initial 3 on this one are a beautiful blue goldstone, and they sparkle :) On these, you pray an Our Father, Haily Mary and Glory Be. There is a rosary centerpiece in the chaplet, and this one features a color image of Our Lady of Fatima, with the holy face of Jesus on the back. The other 12 beads are for praying Hail Marys, invoking the intercession of Our Lady Star of the Sea. In this chaplet, those beads are turquoise jasper and they're fabulous. The color scheme has a definite beachy feel of serene flowing water. I LOVE IT. I'm so glad you like your new rosary chaplet. 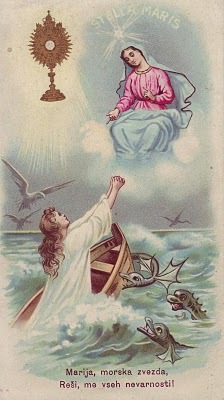 Our Lady Star of the Sea has found a wonderful new home!